The choreographer, dancer and filmmaker Yvonne Rainer is this fall moving from a big retrospective about Judson Dance Theater at MoMa in New York to Weld in Stockholm to create a new piece for Weld Company entitled Again? What now ?. 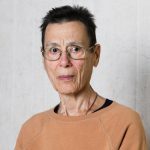 During her visit, Yvonne Rainer will also hold a lecture. Yvonne Rainer’s “Again? What now?” is a new work for Weld Company and is an amalgam of “old” dance excerpts and more recent ideas, including spoken texts, music, and movement configurations. You might call the piece “YR’s Best Bits.” The actual title can also be read as a cry of desperation and protest in response to the fraught state of the world, and more specifically, the current calamitous social and political situation in the United States. Performed by: Andrea Svensson, Noah Hellwig, Anna Westberg, Sybrig Dokter, Robin Dingemans, Max Wallmeier, Kajsa Sandström, Per Sacklén. Yvonne Rainer, one of the founders of the Judson Dance Theater (1962), made a transition to filmmaking following a fifteen-year career as a choreographer/dancer (1960-1975). After making seven experimental feature-length films — “Lives of Performers” (1972), “Privilege” (1990), and “MURDER and murder” (1996), among others — she returned to dance in 2000 via a commission from the Baryshnikov Dance Foundation (“After Many a Summer Dies the Swan”). Since then she has made six dances, including “AG Indexical, with a little help from H.M.,” “Assisted Living: Do you have any money?” and “The Concept of Dust: Continuous Project – Altered Annually.” Her dances and films have been seen throughout the U.S. and Europe. Museum retrospectives of her work, including drawings, photos, films, notebooks, and memorabilia, have been presented at Kunsthaus Bregenz and Museum Ludwig, Cologne (2012); the Getty Research Institute, Los Angeles; Jeu de Paume, École des Beaux Artes, La Ferme du Buisson, Paris, and Raven Row, London (2014). A memoir — “Feelings Are Facts: a Life” — was published by MIT Press in 2006. A selection of her poetry was published in 2011 by Paul Chan’s Badlands Unlimited. Other writings have been collected in ”Work: 1961-73” (1974); ”The Films of Y.R.” (1989); ”A Woman Who…: Essays, Interviews, Scripts” (1999); and “Moving and Being Moved” (2017). She is a recipient of two Guggenheim Fellowships, a MacArthur Fellowship, and a U.S.A Fellowship. Weld Company is aiming to rediscover and revaluate the old institution of Dance Company and is updating the Company form through a collective work conducted by one of Weld clearly given structure. Dancers and choreographers from different backgrounds share a common, daily and physical practice. The Company will work with invited choreographers; self-made works and instigate the Swedish dance history. The members contribute with and are involved in selecting the content. Again? What Now? is produced by Weld in collaboration with Nordberg Movement.